Changes made in 1883 to football’s rules (including the introduction of a point-scoring system) coincided with a successful year for the Red & Blue, lending credence to critics’ claims that Penn’s poor performance stemmed from the type of play required by the recently replaced rules. Six games were won, including two victories over Columbia and Rutgers, and only two games were lost — a dramatic change from the past two years, in which Penn had lost nine games and won only two. Penn’s success continued in 1884, with a notable victory over Harvard in the season’s opening game. As a result the University was invited to join the Intercollegiate Football Association. 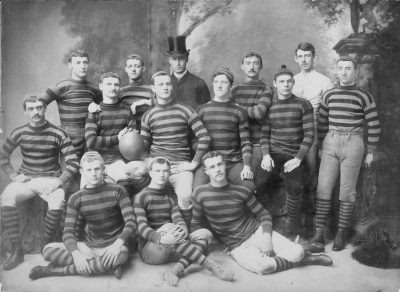 Penn had two more successful seasons before 1887, the first season after the introduction of point-scoring in which more points were scored against Penn than for Penn. In these years Penn ranked somewhere between third and sixth among college teams: not bad, but not as good as the University or its alumni wanted. At the same time Penn gradually increased the number of games it played each season, from an average of four games a year in ’76-’82 to a much heavier rotation of thirteen games in ’85, then to a seventeen game high in ’86, and eventually leveling off in the range of thirteen to fifteen games a season for the next few decades. The exact number of games varied each year, but remained higher than that of similarly ranked teams; Penn’s policy at that time was to play any sufficiently skilled opponent, time permitting, with no cap on the number of games played per season. These years saw two other changes to the University of Pennsylvania’s football program: the addition of coaching and a minor relocation. 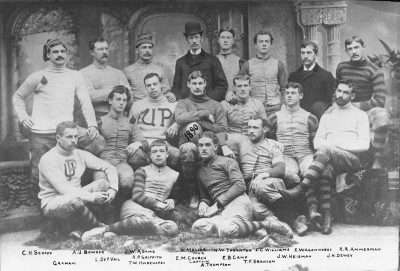 In 1885 Frank Dole became the University of Pennsylvania’s first football coach, and the team began playing games on the newly-built football grounds at 37th and Spruce Streets. 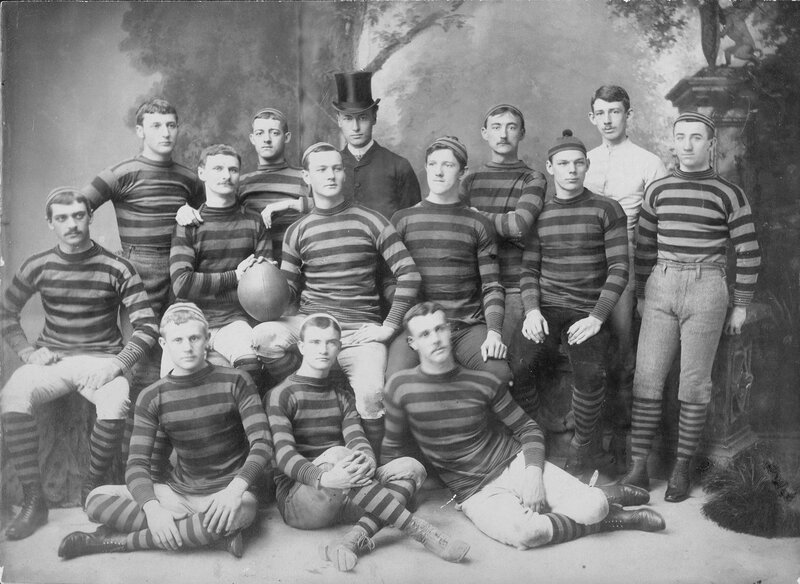 Dole did not coach for long: the team’s losses in the 1887 season led to a restructuring of the football program. In 1888, Ellwood O. Wagenhurst, a Princeton graduate who had recently entered the law department, replaced Mr. Dole as coach. During his three years as coach, Wagenhurst made a number of changes, including requiring the team to live together in one house, apart from the rest of the student body. These changes seem to have worked, as the years of Wagenhurst’s coaching were marked by success. Pennsylvania won most of its games — but notable not those against Princeton, Yale, and Harvard. Despite improvements to Pennsylvania’s football program, these teams proved almost unbeatable; the Penn had succeeded in beating Harvard only a handful of times, and Princeton and Yale not once. Being unable to beat these three teams made it almost impossible for Penn to at any time place higher than third among college teams in either an official or unofficial capacity.